These were so yummy and a perfect way to use out leftover fruits (or in my case, a can of wrongly opened fruit)! Add whatever fruit you want and blend in. Spoon into cupcake lined muffin tins. 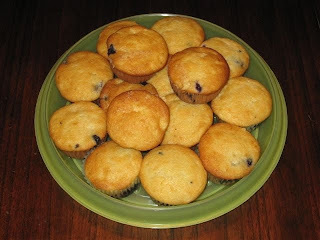 Bake at 350 about 20-25 minutes until done; yields 12 large muffins or 18 normal ones. For this week's Pineapple Blueberry Muffins, I added a can of crushed pineapple (not drained) and a half a container of whole rinsed blueberries. With the pineapples being canned in juice, the batter was moist enough without adding any extra milk. F&B gave them two thumbs up and regular size muffins are perfect for snack bentos or for part of a bento lunch. We also like mini muffins for bentos, but I was out of mini muffin wrappers. Congrats. on the foodie blogroll!